Snail farming is one of the very profitable farming venture you can go into. Its easy to start and doesn't require too much professional knowledge before startup. Today I'm going to tell you why snail farming is very profitable and why it is called a gold mine. I'm also going to refer you to snail farmers that are making it big time. Firstly, Snail meat is a very delicious delicacy consumed in Nigeria and all over the world. It is very healthy and nutritious and prescribed to all because it's not a red meat and also has high protein, vitamins, and minerals content. Snail meat can also be prepared into a lot of delicacies which is enjoyed by many. There is also large market for snail meat in the international market if only you can do a good packaging. Before you can export your snails to Europe and Americas you have to process and package it. You can make millions of naira from this large and inexhaustible market. The demand for snail products locally and internationally is on the increase. Local snail farmer cannot meet the demand of increasing population of 'snail meat' lovers. Snail farmers are making huge profit as the global demand for the delicacy increases. The annual demand for snail in Nigeria is about 7.5million kg annually. The international trade in snails is flourishing in Europe and North America. The United State America imports more than $4million worth of snails annually from all over the world, including Nigeria. France also requires about 15000 metric tons of the delicacy annually. Due to the huge gap in unmet snail demands, Snail meat is costly. You all know that when demand of a product is higher than supply price goes up. The high cost of buying snails is also an added advantage for both practicing and prospective snail farmers. That's why a Snail farmer only needs to invest little capital outlay for snail farming and rakes in a lot during harvest. In Nigeria the prices of raw, unprocessed, matured snails goes for N250 to N600 depending on the size. All you have to do is to start from small and grow big. Imagine having about 1million matured snails to sell at once, you are going to earn millions. Most farmers whom started snail farming newly are always likely to sell their snails unprocessed. The truth is that snail processing will earn you more money especially if you are planning to export your products. Processing your snails will make wealthy and elite of the society to buy from you and hence earn you more money. You can also build a name(brand) for your product. 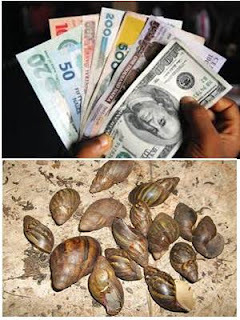 Since snail meat is in high demand abroad you will also earn more. You now see that this is an opportunity for you to get rich. You don’t have to go in search of Job when you can conveniently make millions of naira right at your backyard with little capital. Call me for assistance and consultancy.